If they'd brought home any more championship banners, we'd have to rename a section of rafters at Hommocks Park Ice Rink after them. "Squirt Cubs Corner" has a nice ring to it, don't you think? Eight days after winning the Hudson Valley Hockey League Squirt Premier-Atlantic Division championship as the #4 seed in the playoffs, our 8U Cubs won the Calgary Division at the CanAm Challenge Cup up in Lake Placid, NY. The Cubs opened their tournament with three straight wins, then lost to the Long Island Gulls, 5-0, in the final game of round robin play. They met the Gulls again in Sunday's gold medal game, and this time came away with a 2-1 win on the 1980 Rink inside the Herb Brooks Arena. Three other MYHA teams earned medals during their long weekend in Lake Placid. The Bantam Cubs came home with silver medals after losing a heartbreaker to the Junior Railers in the Vancouver Division final, 3-2, in the fourth overtime period. 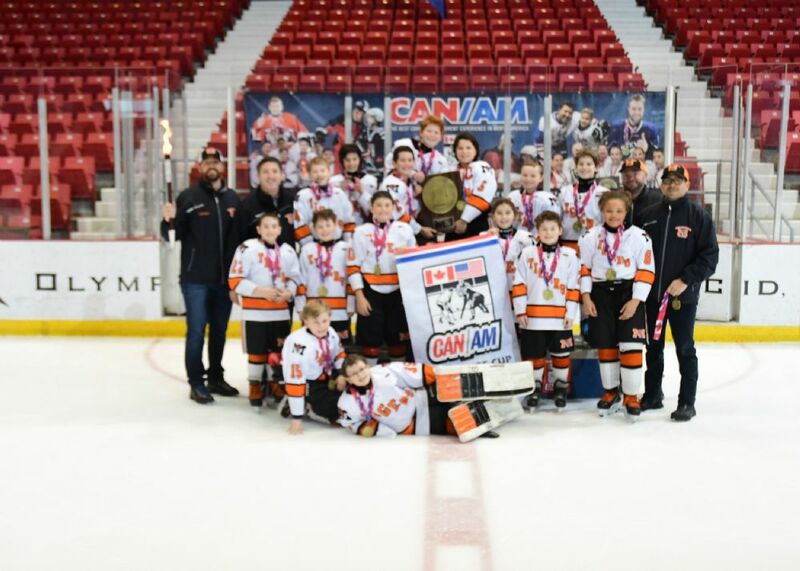 Likewise, the Bantam Tigers -- who went 4-0 in round robin play, outscoring opponents, 26-6 -- earned a silver medal, losing to Rye, 4-3, in the Sochi Division championship. The Squirt Cheetahs brought home a bronze, defeating Scarsdale, 5-1, in the Grenoble Division. While MYHA teams were in Lake Placid and the 15U Girls were in Connecticut competing in the CGHL playoffs, the 16U Girls spent their weekend in Amherst, NY -- site of the New York State Amateur Hockey Association state tournament. Mamaroneck went 3-0 in pool play and advanced to the state semifinal to play Brewster, the team it had beaten in a February shootout at Hommocks to earn the #1 seed in the East Region. This time, the Tigers built a 3-2 lead midway through the second period but gave up the game's final three goals and lost, 5-3. Congratulations to all MYHA teams, from Mites through Midgets. We hope our 240+ players, their families, and all of our coaches enjoyed their seasons, and that everyone made some memories and more than a friends along the way. When it comes to big wins, it's tough to top a double-overtime win over the top seed in the tournament. The 10U Cubs found a way. 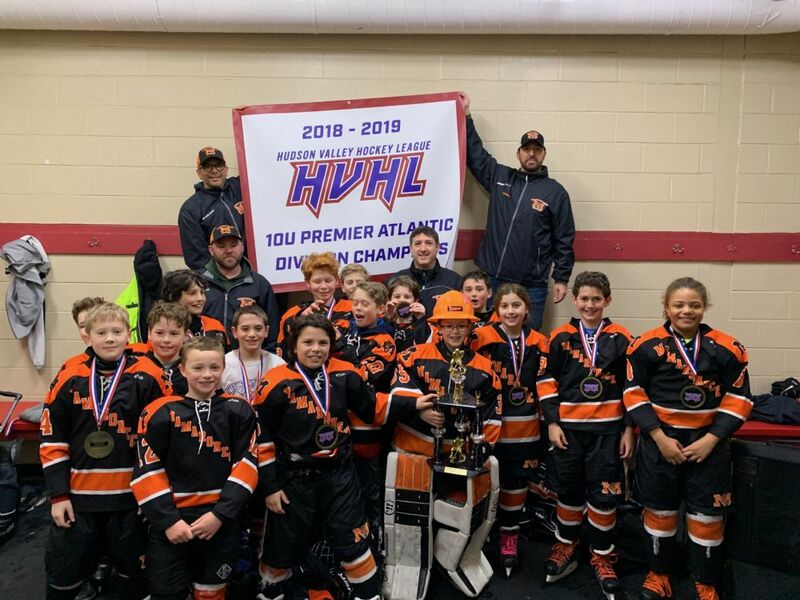 Three weeks after a 2-1 road win over #1 Millbrook, the Cubs beat Rye, 3-1, to win the Hudson Valley Hockey League Squirt Premier-Atlantic Division championship. The win was the Cubs' sixth in their last seven games, and it lifted their record to 21-15-2. Congratulations to the players, coaches and families of the champion Cubs! NOTE: Teams in RED are missing game scores. A critical component of a positive travel hockey experience is the coach your child has the opportunity to play for. That’s why it is a core principle for the Mamaroneck Youth Hockey Association to provide the best-caliber coaching available for our players at all ages and levels of competition. Teaching the sport of hockey to young, developing players. Teaching young athletes how to compete respectfully and enthusiastically. Ensuring that hockey season is the right mix of hard work and fun. Tom Capalbo, Hobart (Assistant Coach, 10U Tigers, LIAHL Tier II): A Mamaroneck native who played for the MYHA as a Mite, Tom played three varsity seasons at Mamaroneck High School before leaving for Northwood Prep in Lake Placid, NY. After two years there, he played one season with the Long Island Bobcats of the Atlantic Junior Hockey League. From there, he moved on to Hobart College, where he and his team reached the NCAA Division III Frozen Four twice in four seasons. championships. At Harvard, Jim played for 1960 U.S. Olympic gold medalist, Bill Cleary, was a member of the 1989 NCAA Championship team, and also contributed to Ivy and ECAC championships. Erik Eaton, Bowling Green (Head Coach, 8U Tigers): Erik is a lifelong Mamaroneck Tiger; he and his brother grew up in the program, playing for their father, Kim Eaton, who helped start the program in the 1980s. Erik went on from Mamaroneck to play at Salisbury Prep, then in the USHL for the Cedar Rapids Roughriders. After junior hockey, Erik played four seasons of Division I hockey for Bowling Green State University, and then played professionally in the USHL. Brett Jackson, Nichols (Assistant Coach, 18U Tigers, LIAHL Tier II): Brett played Division III hockey at Nichols College, where he won two ECAC Northeast championships. Prior to Nichols, Brett played for the Brewster Bulldogs and Applecore junior teams. Brett is a graduate of Mamaroneck High School, where he earned second-team all-state honors. Ryan LeBlanc, Fordham (Head Coach, 16U Tigers, LIAHL Tier III & 14U Cubs, HVHL Atlantic Division): Currently a senior on Fordham’s hockey team, Ryan graduated from Mamaroneck High School in 2015. He played defense for the MHS varsity hockey team throughout high school, and was a team captain for the Tigers during his senior year. Mike Loga, Dartmouth (Head Coach, 15U Girls, CGHL Division I): Mike played Division I hockey at Dartmouth, and he was elected team captain during his senior season. Prior to Dartmouth, Mike played two years in the BCJHL for the Powell River Kings. He later played minor league hockey in what he calls “the greatest hockey city in the world”: Edmonton, Alberta, Canada. played for the New York Applecore throughout high school. Following high school, Chris played two seasons with the Cedar Rapids Roughriders of the USHL. He went on to play Division I hockey at Bowling Green State University, and then played professionally with the Dayton Bombers of the ECHL. Adam Platt, Manhattanville (Head Coach, 14U Tigers, LIAHL Tier II): Adam played four years of hockey at the Salisbury School, followed by two years of junior hockey. He then played four seasons of Division III hockey at Manhattanville College. Jay Quenville, Yale (Head Coach, 12U Tigers, LIAHL Tier II): Jay played Division I hockey at Yale University, which won several Ivy League titles and Yale’s first ECAC championship during his tenure. After graduation, he played professionally in Europe. Prior to Yale, Jay played two years at Taft. He also played for Malone Minor Hockey in upstate New York, and as a young player was a member of Franklin Academy’s lone trip to the New York State Championships in the early 1990s. Miro Recicar (MYHA Goalie Coach): Miro has been a professional goalie coach for 10 years and is finishing his first season as dedicated goalie coach for all MYHA teams. He played professionally with the Brooklyn Aces and Elmira Jackals of the ECHL, and back home in Slovakia for the HK Presov Penguins. Miro has spent several seasons as the goalie instructor at Chelsea Piers in New York City. 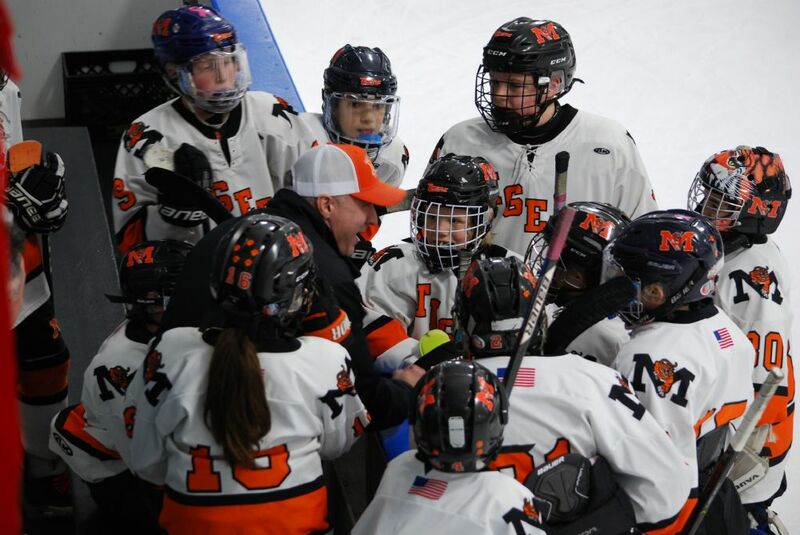 Steve Thompson, Bowdoin (Head Coach, 18U Tigers, LIAHL Tier II): Another lifelong Mamaroneck Tiger, winning the New York State Squirt C championship in 1994. Steve played four years on the Mamaroneck High School varsity ice hockey team and served as co-captain during his junior and senior seasons. As a senior, Steve also played with the New York Applecore. After graduation, Steve played Junior A hockey with the New York Applecore before attending Bowdoin College and playing four years on the varsity ice hockey team.